Her refusal to surrender her seat to a white passenger on a Montgomery, bus in 1955 was not the first time Rosa was forced off a segregated bus. In a strange twist of fate, the same bus driver whose actions spurred on a city-wide boycott and helped launch nation-wide efforts to end segregation of public facilities, had forced her to leave his bus in 1943 for accidentally sitting in seat reserved for whites. Rosa's quiet strength and dignity launched a boycott of the Montgomery buses for 381 days, and began Dr. Martin Luther King Jr’s rise to leadership in the national battle for Civil Rights. The soft-spoken, mild-mannered, hardworking lady became the symbol that the Montgomery NAACP and the Women’s Political Council needed to challenge the law. Rosa continued to work for the NAACP and the newly formed Montgomery Improvement Association under the leadership of then 29-year old Dr. Martin Luther King, Jr.
Born Rosa Louise McCauley, on February 4, 1913, in Tuskegee, Alabama. Rosa's childhood was influenced by both racial discrimination and activism for racial equality. Her grandparents were former slaves and strong advocates for black civil rights. As a girl, Rosa watched her grandfather stand in front of their house with a shotgun while Ku Klux Klan members marched down the street. She attended sub-standard, segregated schools first in Pine Level, Alabama, and later in Montgomery. Rosa was forced to leave school in 1929 to take care of her Grandmother, but returned four years later to finish her high school degree. In 1931 Rosa was already a respected civil rights activist, deeply involved in seeking justice for the Scottsboro Boys. In 1932, Rosa married Raymond Parks who was a founding member of the National Association for the Advancement of Colored People (NAACP). Rosa and Raymond were actively engaged in fighting racial injustice. Their actions to appeal the death penalty imposed on the Scottsboro Boys exposed them to daily danger with constant risk of reprisals. It was not until 1950, that the last of the nine Scottsboro Boys was released on parole. Rosa made her living as a seamstress but on her lunch hours and after work she would work on NAACP projects. As Secretary to NAACP President Ed Nixon, she worked to document the racial injustice in the voter registration process. The Poll Tax and the Literacy Test were two great stumbling blocks to voter registration because whites could demand stiff poll taxes and not announce when the literacy test would be administered. 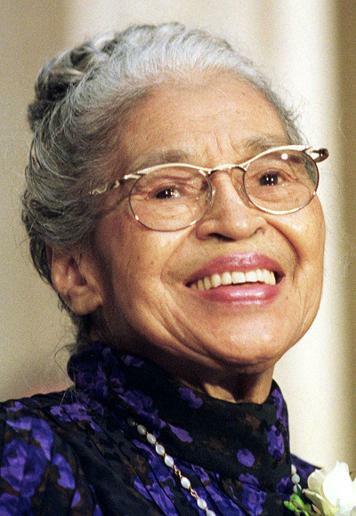 In 1945, Martin Luther King was 19 years old, and Rosa Parks was finally able to cast a vote at the age of 32. It was Rosa’s active involvement with NAACP that eventually led to her arrest on December 1, 1955. Seated in a colored seat on the bus, Rosa was absorbed in her thoughts of preparing for an upcoming NAACP Youth Council conference. Unaware that the white section of the bus had filled up, she was roused from her reverie by the bus driver’s harsh command to stand and give her seat to a white man. Rosa decided she was tired of the treatment she and other black Americans received every day of their lives. Quietly and respectfully, when the bus driver asked her if she were going to stand up, Mrs. Parks just responded, “No.” The bus driver said, “Well, I’m going to have you arrested.” She answered, “You may do that.” Those were the only words exchanged. Rosa was arrested, charged with, and convicted of civil disobedience. Within the span of her life, Rosa has been actively peered by the most influential leaders in black American history. She has been presented with numerous awards for her contribution in forging positive change in a time when social inequality was commonplace. In 1992, she published Rosa Parks: My Story, an autobiography recounting her life in the segregated South. In 1995, she published her memoirs entitled Quiet Strength which focuses on the role religious faith played in her life. On October 24, 2005, at the age of 92, Rosa passed quietly. Her death was marked by several memorial services, among them lying in state at the Capitol Rotunda in Washington D.C. where an estimated 50,000 people viewed her casket.